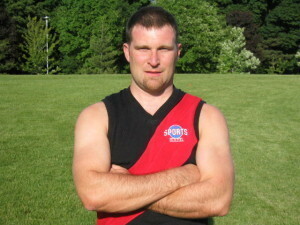 During his 122 games spanning almost two decades with the Toronto Dingos Football Club, Shawy (as he was affectionately known as), embodied the tradition, loyalty and pride associated with the Dingos. On the field, Shawy kept things simple. He possessed quick hands, could kick effectively with both feet, never backed away from a hard contest, ran in straight lines and at times made hard things look easy. He was clever and creative but took on a simple approach to generating run across the half back line and through the midfield. He could kick the ball a mile, and rarely wasted possession of the ball. During his prime, between the premiership era in the early to mid 00’s, Shawy made his name as a rugged, unrelenting defender, but also evolved into a contested ball winner and efficient ball mover in the midfield. Not known as a prolific goal kicker, Shawy did manage 50 goals throughout his career, often drifting forward in an unassuming fashion from half back. When he retired from football, Shawy owned the record for most years as president (five), only to be eclipsed by Craig Stewart in 2013 whose term lasted six years. Then in 2004 Shawy booted five goals in a Semi Final against the undefeated Eagles as the Dingos ran away with that game by 40-pts. “With 5 goals from the wing he was outstanding. His long straight kicks drove the dagger into the Eagles heart deeper with every goal. He made himself an option through the center and took some strong marks to be rewarded with quite possibly his best game of the season too,” the match report said. Words like “stoic”, “inspirational” and “team player” have all been used to describe Shawy’s football throughout his career. Former president, Life Member and leading Dingo goal kicker, Craig Stewart, said that Shawy was the ever reliable half back flank during the premiership years, but also what was more important than his on field abilities was his contribution to the club as president. In 2007 Shawy’s deeply passionate club values came to the fore as president. I recall a Round Four encounter against the Eagles where we could only manage 14 players. It was a weeknight match at Humber North. The belief was, if we played, we’d get torched playing 14 against 18. The night before the game Shawy weighed in on email which went something like, “We are playing with 14. We are the Dingos. We don’t forfeit. Let’s go out there with 14 and have a crack.” The 14 went out there and lost by 95-pts but the message from Shawy was clear: Dingos fight and have a go, even when the odds aren’t in our favour. I’ve never forgotten that and that spirit is something that still exists within the fabric of the club today. Tim Shaw was born on October 7, 1971, a Melbourne boy, the oldest of three children, with two sisters Rebecca and Liz. As a teen he played his football at Caulfield Grammar and later for Lobethal in the Hills Football League. He showed interest in other sports, including tennis, surfing and anything outdoors. In 1994 Shawy completed a combined degree across the Engineering and Science Faculties at Melbourne University, then in 2000 he embarked on a career in software development in Toronto. In 2013 Shawy was ratified and inducted in the Toronto Dingos hall of fame as the 8th Life Member at the time, and joined his great mates who had also became Life Members in Stu Wallis, Paul Tinkler and Craig Stewart. Whatever Shawy accomplished at the Toronto Dingos, he did with a minimum of fuss. If it needed to be done, he did it. He organized football trips, golf days, Grand Final parties. he managed relationships with sponsor pub Sports Café. During his presidency, he ran the club’s footy tipping competition and was part of the Dingo All-Star team of the past 20 years; he was an extremely good organizer of men and one of those naturals at sport. Shawy's impact on this club both on and off the field was paramount to its growth and success. President of the Toronto Dingos Football Club, Everett Wells, said it was his presence off the field where he had the biggest impact on people at the club: in the pub after a training session; on the sidelines after a game; and in the vans on the way home from (another) Montreal footy trip.